It's hard to imagine that 2 weeks have passed since the 5th ISHGD. For many of us at Transoft, members of the organizing team are still feeling the effects of 'withdrawal' after hosting such a successful event. Yet here we are unwilling to let fade some great memories... let's take a look back at what went on during the Symposium. Some of you may have chosen to attend a Workshop or two and if so, you likely weren't disappointed. With a variety of topics to choose from there were enough to appease most anyone's interests. Of course the heart of the Symposium lies with the podium and poster sessions where delegates were treated to outstanding research papers. Tuesday morning attracted many delegates into Ballroom C to learn from the many excellent technical posters. Transoft Solutions' CEO, Milton Carrasco, and Co-Chair of the Hosting Committee kicked things off with a warm welcome. Next up were Jerry Dobrovolny from the City of Vancouver and Geoff Freer from the BC Ministry of Transportation & Infrastructure. Delegates were then treated to a lively and entertaining presentation by Julie and Colin Angus who shared their experiences circumnavigating the globe via foot, bike and boat! Angus Adventures featuring Julie and Colin Angus "Rowboat in a Hurricane"
Monday night featured the rhythmic tunes of KOKOSOUL as delegates enjoyed cold beverages and a variety of canapes during the Reception on the Terrace, sponsored by McElhanney Consulting Services. Tuesday's event "Our Vancouver: A Multicultural Experience" sponsored by CH2M featured a host of outstanding performances from local artists. The ISHGD featured a select group of exhibitors showcasing a range of technologies and services. If you were fortunate enough to attend to one of the 3 tours then you likely received an equal amount of information and entertainment. Whether you toured the Sea-to-Sky, Gateway Project or biked the streets of Vancouver, we're sure you walked away with more knowledge about the fine city of Vancouver. We'll continue to post up more on this blog so be sure to stay tuned! Arriving from the U.S.A. or an International Destination? Once through the customs and immigration arrivals process, walk toward the exit to the International Arrivals Greeting Area. Exit the building following signs marked Canada Line. Before the parkade entrance, an escalator and elevator will take you up to the Canada Line platform. Pay for your ticket, get on-board and take the train to the end of the line, “Waterfront Station”. To walk to the hotel, exit the station, turn right at Cordova Street and right again on Howe Street onto Canada Place Way. The Fairmont Waterfront is on your left hand side. Estimated walking time is 5 minutes. Join us after the day’s sessions to unwind and connect with your colleagues in a social setting. Your Symposium registration includes tickets to both events! Bringing your spouse, a family member or a friend? Invite them along — be sure to buy them a ticket so that they can enjoy these opportunities as well! Join us at the Fairmont Waterfront’s sun-drenched terrace located on the 3rd floor surrounded by Vancouver’s infamous north shore mountains. Canapés and cocktails will be served while the rhythmic sounds of KOKOSOUL play an eclectic mix of tunes from a bygone era to modern times. Come as you are to enjoy the sun and network with your colleagues on the pool terrace. A perfect opportunity to connect with old colleagues and meet new ones! 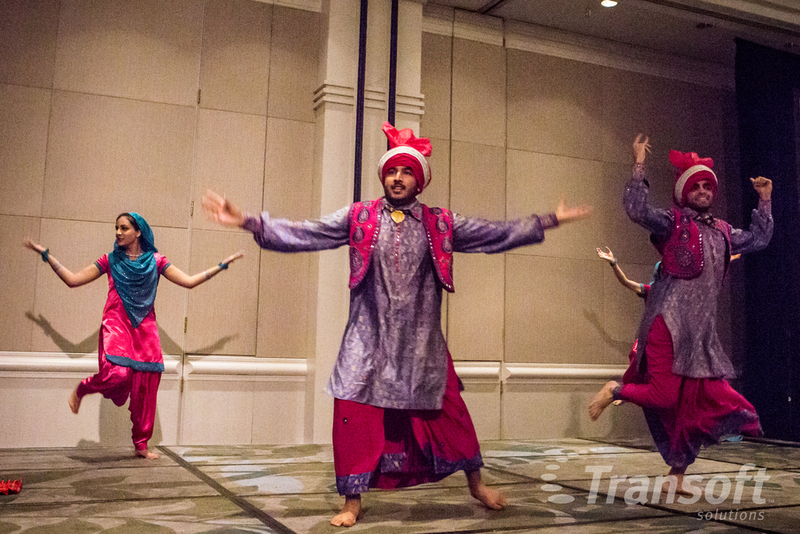 Delegates will be in for a treat Tuesday night as the ballroom transforms into a showcase of Vancouver’s rich multicultural scene. Get ready for sensory overload as dazzling live performers tell riveting stories through music and movement. We'll enjoy performances from the First Nations, China, Latin America and India as we enjoy a delicious three-course meal and wine produced in the Okanagan Valley, British Columbia. Attire is "business casual" so come spiffy and well-heeled! Please send an email to info@ishgd2015.net with any dietary concerns. IMPORTANT NOTE: If you already know that you won’t be able to attend one of these events, please send an email to info@ishgd2015.net. This will help with our final preparations - please let us know by 16 June. Symposium attendees are going to be in for a real treat when Colin and Julie Angus share their story of adversity and uncertainty. The story began when they both set off on a quest to become the first to row across the Atlantic from mainland Europe to mainland North America. Their story is one adventure and courage. Within their keynote Julie and Colin will share techniques to deal with changing environments including altering our perception, preparing for the unexpected, assessing risks, and improving communication. Take a ride - get a kid's take on transportation engineering! Tour Falsecreek and enjoy Vancouver’s spectacular waterfront scenery on the Aquabus. Check out the oldest and one of the longest automated driver-less light rapid transit systems in the world, the SkyTrain. The Waterfront Station is the terminus for all lines - take it to head to one of the many kid-friendly activities in the city or turn it into an activity unto itself! Heading to the North Shore? At Waterfront station, hop on the seabus, a passenger only ferry that crosses the Burrard Inlet, connecting downtown Vancouver with the North Shore. Each ferry departs every 15 minutes during the day and every 30 minutes in the evening and takes 12 minutes to cross. Get aboard the Stanley Park Miniature Railway, which will transport you through the forest on a winding, 2 km ride over trestles and through tunnels. The train is replica of the CPR Engine #374. The real one is on display in Yaletown. If you do nothing else in Vancouver, this is the must do. The Stanley Park Seawall is a glorious 8.8-kilometre (5.5-mile) paved route that loops around the park connecting the park to downtown Vancouver Be sure to take your camera for selfies of you and your kids enjoying the iconic views of the city. Take the Skyride, a gondola up to Grouse Mountain. This is by far, the best vantage point of the city. Zip across the Grouse Mountain and enjoy every second of the jaw-dropping scenery. Because it goes by fast. Crazy, awesome fast. Venture out on the Cliffwalk, a heart-stopping journey through the rainforest on a series of unobtrusive cantilevered and suspended walkways jutting out from the granite cliff face above the Capilano River. Stay for all the other adventures you'll find at Capilano. Get to Lynn Canyon and cross the suspension bridge. The bridge is quite narrow and crossing becomes a little nerve racking when there are several others trying to cross at the same time. The view from the middle of the bridge is breathtaking! Learn something new - and have fun doing so! Get scientific at Science World. Check out the newest exhibition and meet T-rex's bigger, badder cousin and other dinosaurs too. Spend the day exploring all things related to science. Visit the The Vancouver Aquarium in Stanley Park and learn about the sea-life found just steps away from the aquarium, in the Arctic or from more tropical locations. It's home to more 70,000 creatures including dolphins, sea otters, anacondas, three-toed sloths, eels and more. This underwater wonderland is home to a dizzying variety of fish and aquatic mammals in natural habitats. Kids can gape at the multi-coloured life inside a tide pool, and marvel at deadly piranhas, scary insects, and even a shark. The whale pool is a must, especially around feeding time. Take a tour of Engine 374 at the Roundhouse Community Centre in Yaletown. This engine was made famous for pulling Canada's first transcontinental passenger train into Vancouver in the late 1880s. The centre was the western terminus of the Canadian Pacific Railway and is now a provincial heritage site. Can't visit all of Canada? No problem - Fly Over Canada and feel like you've seen the rest of the country. Start planning for your next visit to our beautiful country! Learn more about Vancouver at the award-winning Museum of Vancouver in Kitsilano. Permanent exhibitions tell the city’s stories from the early 1900s to the late 1970s and are complemented by contemporary, groundbreaking feature exhibits. The Museum of Anthropology is a place of world arts and cultures with a special emphasis on the First Nations peoples and other cultural communities of British Columbia. The Museum is built on traditional, ancestral, unceded land of the Musqueam people and embodies the essence of Canada’s West Coast. And while you are there, check out the lands of UBC. Get wet - the city is surrounded by water after all! Take a dip at the Second Beach Pool, a heated, outdoor pool located near the beach, trails, and forest of Stanley Park. Kayak out into English Bay. Rent kayaks from ecomarine at Jericho Sailing Centre. Splash about in the Variety Kid's Water Park, Vancouver’s largest outdoor water park of its kind. Be ready to get soaked by water guns, geysers and canyons. You'll find it near Lumberman's Arch in Stanley Park. Brave the cold waters of the Pacific Ocean and swim in English bay. Your kids will love the floating slide and you will appreciate the full time lifeguard. After exploring Granville Island, stop to cool-off in the Water Park and get ready to plunge into the biggest free water park in North America! Explore freely - and for free! Take a hike! The North Shore's steep incline composes of six mountain peaks: Black, Strachan, Hollyburn, Grouse, Fromme, and Seymour Mountains. Why not try the famous Grouse Grind or the Baden Powell Trail which will take you from Deep Cove to Horseshoe Bay. Or head to Pacific Spirit Regional Park. The park protects a variety of landscapes including ocean beaches, upland forest and fragile bog, and offers over 73 km of hiking trails and 50 km of equestrian trails. Giggle along with the statues in A-maze-ing Laughter. Impossible not to laugh! Continue your art tour in English Bay. Visit the Steam Clock in Gastown, the first steam-powered clock in the world, still operating today. Every 15 minutes it whistles the Westminster Chime shooting steam from its five whistles. Let the kids loose at the Kids Market on Granville Island. It was recently named one of the Top 3 Favourites in the Westcoast Families Reader's Choice Award for Best Local Family Attraction Category. Enter Chinatown through the Millennium Gate on Pender and Taylor streets. Take photos and admire the architecture covered with both eastern and western inspired symbols. Watch the float planes land as they come into Coal Harbour. Eat something - you'll need nourishment to keep up with the younger ones! Order a Pirate Pak at Whitespot. Somewhat of a provincial treasure in BC and very kid-friendly, they've been serving up their patented and outrageously delicious Triple "O" Burgers and fresh cut fries since 1928. Take the family to the Old Spaghetti Factory and dine in the vintage trolley car that's right in the middle of the restaurant! Pack a picnic and head to Lighthouse Park to enjoy the sunset over the Pacific. Looking for something sweet? Frequent a different gelato spot every day - check out this list of best ice-cream and gelato in Vancouver. For quick service with affordable prices stop at the conveniently placed concession stands in Stanley Park. Grab a picnic table and dine 'al fresco'. Be sure to try the fish and chips! Grab lunch from the Public Market or one of the many food outlets at Granville Island and grab a seat to watch one of the many buskers that dominate the entertainment scene during the summer or head to the waterpark. The 5th International Symposium on Highway Geometric Design promises to deliver engaging and educational content featuring papers, posters, and country reports by some of the world's top transportation researchers and engineers. Technical content will fall under 25 wide-ranging categories covering everything from human factors influencing road design, performance based design and safety implications, sustainable design, roundabouts and many more. A draft program has been published on the Technical Program page. Please note that this a draft version and is subject to change. Changes will not be published until early June. In addition to technical program, the Symposium will also features 7 workshops and 3 interactive tours. Be sure to register today if you haven't done so already! In a matter of seven weeks the brightest minds in transportation design will be arriving in Vancouver for the 5th International Symposium on Highway Geometric Design. So far, some 300 individuals from 38 countries - this truly is an international event! With this wealth of diversity, the Symposium promises to be a huge learning opportunity for those in attendance with over 150 presentations delivered by some of the top transportation researchers and engineers from around the world. The technical content will consist of informative sessions on geometric design issues throughout the world, together with country reports featuring recent developments in road design, policy and practices, design and research products and technical tours of local highway design and construction practices. Together with seven topical workshops and three technical tours, the symposium is a MUST for anyone working in the field of road design and road safety. Besides being a great learning opportunity, the symposium provides a networking opportunity like no other conference that we are aware of. If you haven’t done so already, please click here to register. Join us for workshops on Sunday, June 21 and Monday, June 22 that are being held prior to the Symposium. These workshops provide a great opportunity to discuss and learn more about the geometric design process. The seven workshops span two sessions on the afternoon of Sunday 21, June and the morning of Monday, 22 June. Space is limited to a maximum of 35 attendees per workshop. Registration is on a first come, first served basis. Workshops 2-7 are four hours in length on Sunday afternoon and Monday morning and cost $125 each. Special thanks for the moderators for putting together these informative workshops. We have limited space for each workshop to maximize learning and discussions so register today! Click here to learn more about each of the workshops. Launched in 2006, the Gateway Program was introduced to address growing congestion and reduce travel times. The existing Highway 1 corridor from Vancouver to Langley was one of the three priority corridors identified in the Gateway Program. Built in the early 1960s when the population of Greater Vancouver was 800,000, it now serves as the only major east–west corridor for Greater Vancouver’s 2.5 million inhabitants, with the Port Mann Bridge alone carrying approximately 127,000 vehicles per day. Traffic had increased to the point where the bridge was congested, in both directions, 13 hours on an average weekday. This video that illustrates the time savings that many commuters are experiencing. The Port Mann/Highway 1 Improvement Project is the largest transportation infrastructure project in B.C. history. It includes doubling the capacity of the bridge and widening the highway from Vancouver to Langley – a distance of 37 kilometers. Now completed, it reduces travel times by up to 30%, and saves drivers up to an hour a day. Key features of the Project included extending the HOV lanes eastward into Langley, construction of transit and commercial vehicle priority access as well as improved and expanded cycling and pedestrian networks. The Project also allowed the reintroduction of public transit to a corridor that has been too congested to support reliable service for the past 20 years. The tour will take you along Highway 1 and across the Port Mann Bridge showcasing the complicated interchanges along the route. There will be stops to discuss the complications and view the solutions the team provided. The tour will also include a visit to the Traffic Control Center. For further information, visit the Project Website. There are currently 10 spots remaining so be sure to register and sign up for this tour! Welcome to the North Shore! The North Shore is home to Vancouver's mountains and is an adventure playland. Once you've taken the Seabus from the Waterfront Terminal you've crossed over to the other side, and technically you've left the City of Vancouver.The North Shore comprises of North Vancouver and West Vancouver. Sound like a local and refer to the cities as North Van and West Van - not to be confused with the West End and the West Side! Get on a mountain bike and explore. Test your skills on Mt. Fromme. Discover why the term "Shore Riding" or "Free riding" originated here. Learn about our one of our First Nations cultures and enjoy the landscape and beauty of the North Shore. Take a tour with Takaya Tours and explore the Rainforest or paddle in a replica Coast Salish canoe. Take a hike! The North Shore's steep incline composes of six mountain peaks: Black, Strachan, Hollyburn, Grouse, Fromme, and Seymour Mountains. Why not try the famous Grouse Grind or the Baden Powell Trail which will take you from Deep Cove to Horseshoe Bay. Go golfing. There are several courses in the area from Par 3's like Ambleside and Murdo Frazer, to the more challenging Glen Eagles or Northlands. Are you the daring sort? Get to Lynn Canyon and cross the suspension bridge. The bridge is quite narrow and crossing becomes a little nerve racking when there are several others trying to cross at the same time. The view from the middle of the bridge is breathtaking! Check out the latest in fashion and style at Park Royal. Or choose to window shop in the boutiques in Ambleside Village. Must do: Cross the Capilano Suspension Bridge to towering evergreens and cedar-scented rainforest air. Have a Treetops Adventure and cross the seven suspended footbridges which offer views 100 feet above the forest floor. Or do the Cliffwalk, a heart-stopping journey through the rainforest on a series of unobtrusive cantilevered and suspended walkways jutting out from the granite cliff face above the Capilano River. Must see: The view of beautiful Vancouver from Grouse Mountain. Take the gondola up the mountain and enjoy all that the mountain has to offer. Go ziplining or have breakfast with the resident grizzlies! The Beachhouse, 150 - 25th Street, West Vancouver - At the foot of West Vancouver's Dundarave Pier is one of the North Shore's most celebrated landmarks. Home of acclaimed West Coast cuisine and award-winning wines, the Beachhouse was just voted as the best North Shore Restaurant. The Little District Roadhouse, 1336 Lonsdale Avenue, North Vancouver - a Southern inspired Roadhouse serving rich food, premium drinks and lively banter. You’ll find a wide range of dishes to satisfy any craving. Location: North of downtown, across the Burrard Inlet.